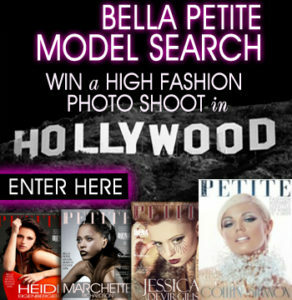 Thankfully, we at Bella Petite have been on a mission to represent, sponsor, and promote models and talent that are 5’7″ and shorter, advocating petite models representation for our inclusion in the fashion industry by storm! Bella Petite represent those of us who aren’t 5’9” and taller in an industry that excludes the majority of women worldwide. Nonetheless, there are always negative voices that will try to discourage models who aren’t the industry standard from joining the ranks of prestigious supermodels. To open a more positive discussion with you, I’ve outlined four things that I, a petite model, hear all too often from people who think shorter models can’t be successful, along with sharing my personal thoughts. 1. You’re not tall enough to model. The truth is most tall models 5’9″ and taller fear petite models and all other shorter models. They want to rule the high fashion runways exclusively. Perhaps that criticism be may be accurate, but even that niche within the fashion industry is rapidly changing. While it likely will be a slow and gradual change, there is a high chance that petite models will be the next big thing! I’d bet on it because of women like our editor-in-chief Ann Lauren of Bella Petite. She has dedicated her life’s work to making change happen with her events, pageants, televised shows and now BellaPetite.com and their International Magazine Cover Model Search. Thanks to Bella Petite Magazine, I secured a cosmetics campaign. Keep in mind that there are many different types of models, not just those who walk on the runway. Despite that is the first image that comes to mind for most of us. The truth is, there is print, editorial, catalog, commercial modeling, promotional modeling, parts modeling, and more. There are opportunities out there for petite models, starting right here at Bella Petite, like me a Cover Girl for this magazine. 2. You’re not thin enough to model. Not every model has to be rail thin. Sometimes being a healthy, average-sized or plus-sized is what a client may want. Your desire to change your body should not be determined by a potential job offer. Do keep in mind that the targeted customer is what defines the job guidelines. Models are wanted in all shapes and sizes. Especially here at Bella Petite Magazine and by their clients and advertisers. Don’t buy into the lie that you have to be no larger than a size 4 to have a successful career as a model. 3. There are no opportunities in the industry for you. People who usually say this have no idea of the myriad of available possibilities for models. Yes, maybe the era of supermodels is over, and yes, maybe you’re not the next Gisele Bunchon, but that doesn’t imply there is anything or mean you can’t make money for yourself in the field. Models are wanted for trade shows, races, conventions, for cosmetic campaigns, commercials, and so much more. Sometimes, a models attitude and willingness to be pleasant and work hard is what hooks a client. 4. Your dreams are unrealistic. Modeling, for most, is a temporary and fleeting career. You should focus on building more than your looks, including education and trades you may be great at doing. Modeling is a career that can be rife with hardships. The majority of models have to freelance to find his/her next big job. Job opportunities may not always be steady. It may be a full-time job seeking other work, but many models love the experience nonetheless. They love what it feels like to feel fierce, to represent a brand, to have a piece of themselves immortalized forever on a spectacular image. The tall, average model at 5’9″ and taller earns less than 50k a year. If you know a model that may be an aspiring petite model, please don’t repeat the points above in conversation. I assure you, they have already heard it all before and understand the risks and rewards. Knowing those things, is quite frankly, part of the job. However, the petite fashion takeover is very much in full-swing and perhaps it won’t be too long before the fashion industry as a whole, welcomes, all body types and women of all heights as well. I for one am proud to be a cover girl and subscriber of Bella Petite Magazine and our fashion initiative calling for change, it’s about time!